Visiting the Lake Eufaula Ok area and looking for something to do? 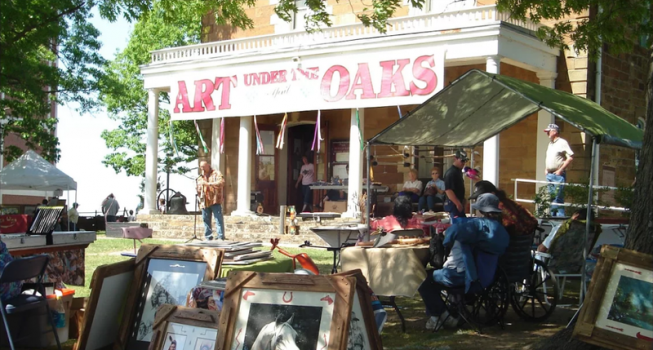 Then, mark you calendars for the Art Under The Oaks Festival & Market from April 6th through April 30th. The event takes place at the Five Civilized Tribes Museum which is located at 1101 Honor Heights Drive in Muskogee, Oklahoma. The community event includes arts and crafts from various nations: Cherokee, Creek, Seminole, and Chickasaw. Basket weaving will be included during the festival as well as flint knapping. Live music will be playing and native foods will be offered. For more info, please call 918-683-1701.